Hamby Home(in)stead ...: Free chooks aren't cheep! 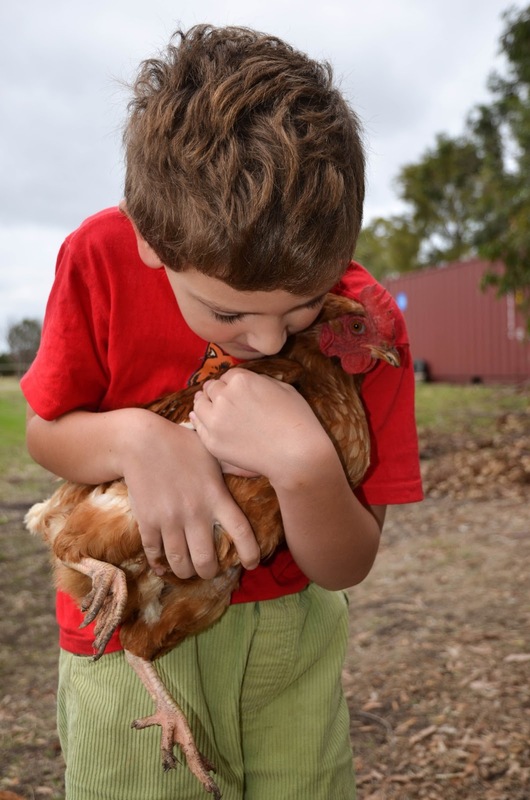 We love our chookies - although it is only Vaughan who insists on giving them "cuddle-ups"! I am not sure that they enjoy the physical affection but they do tend to crowd round when they see the Young Master, probably cos they associate him with crickets! The girls gifted us 20 eggs in their first week and seem set for a similar effort as their second week draws to a close. When they arrived we bought some pet hay and a small bag of pellets from one of the local pet supply shops - as an interim measure, cos we hadn't done much preparation beforehand. Yesterday we bought 20 kilos of organic grain mix from a local farm and a bale of straw from a livestock supply company. Both should last well over a month, which would equate to around $1.00 a day for our girls' food and bedding, praps less when the actual figures are known. Keeping them safe is proving far more expensive! To date the fencing purchases tally $570.00 (and we are not yet done) - that's $142.50 per chook, so far!! The old cliché of not being able to put a price on happiness does ring very true though. We are certainly a much happier Hamby family since being gifted the chookies!